The measure of how much a person takes full advantage of life is directly proportionate to how much that person loves to eat. 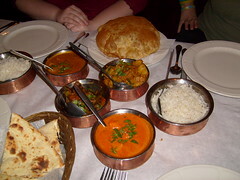 After telling a friend about our recent excursion to an Indian restaurant, she said that the amount of food we ate was directly proportionate to an eating disorder. I guess she would know, considering she is a psychologist — insert sarcasm — and I am merely a food addict. 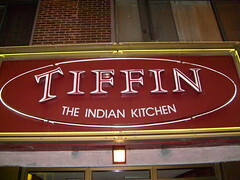 My friends and I went to Tiffin Restaurant at 2536 West Devon Avenue on Chicago’s North Side. Allow me to paint a picture for you. The strip where this restaurant is gives you the feeling that you are in New Delhi or Bangalore. 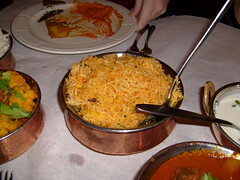 Indian restaurants, street food shops, electronics shops, Indian grocers, and side shops line over a mile of Devon Avenue. Just breathing the air transports you way off to the other side of the world. 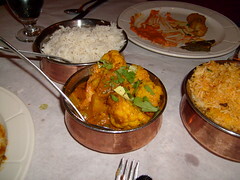 Although transport to India did not occur, Tiffin Restaurant served as an outstanding placebo. Unlike many of the small side shops on Devon Avenue, Tiffin has a sit-down feel to it. 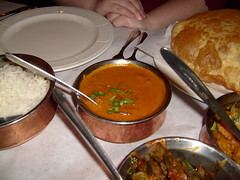 The restaurant is large and the one indicator we look for in the authenticity of a restaurant was present — the fair amount of Indian patronage. Joining us this evening was a guest, who has now been thoroughly inducted into our eating society. But we had to look out for the sharp dressed woman with the nice pair of shoes on. No sooner had one of my friends received the text from our fellow foodie who was running a little late than she walked in the door. It was on then and she wore those shoes well. We started with an assortment of appetizers. We ordered samosas, which were flaky golden pastry, stuffed with delicately spiced potatoes and green peas. 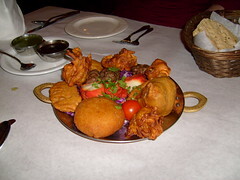 We had pakoras, which were crisp assorted vegetables — onions, potatoes, and cauliflower — golden friend in a light batter. There were seekh kebab — a spiced and tasty rolled sausage. And there was also chicken tikka that had been slow cooked in a clay oven to the point where it fell apart while picking it up to eat. Happiness abounded and the oink meter began to waver. When my friends said that I was going to do the ordering, I don’t think they realized what they were getting into. I may have the physique of an Abercrombie and Fitch model, but I have the constant appetite of Paul Bunyan. [Wait. I don’t remember reading that he had and appetite, just an axe and a blue bull. So, I shall say that I have an appetite like a man who takes full advantage of life.] I prefaced the order with, “For our first course,” and I kid you not. The order that went in was for bhindi masala, which was tender okra sautéed with onions and tomatoes, and blended in herbs and spices. There was also an order of achari aloo. These were potatoes steamed and sautéed with spices, cumin seeds, fennel, rye, and fenugreek. 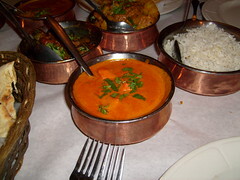 To accompany those two vegetable entrées, we had murgh tikka masala — marinated boneless pieces of chicken grilled and sautéed in a delicious creamy sauce. Hello! But that was not all. 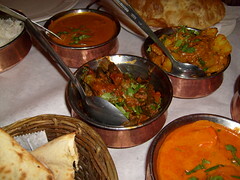 We also had Kashmiri rogan josh. This particular dish, which has its base from the North West, is a favourite dish of Kashmir. 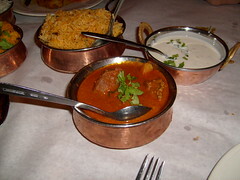 This was lamb cooked in a traditional Kashmiri masala, with saffron and yogurt in a velvety sauce. Talk about happiness. Talk about taking full advantage of life. Talk about watching the oink meter swinging back and forth like a pendulum out of control. 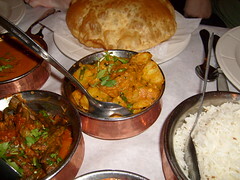 Oh, I forgot to add that we had rice, naan, and poori to go along with the entrées that we devoured. One would think that after having feasted on so much good food, we would have requested the bill, paid it, and went on our merry way. To think that is to not know us. My friend Randall asked for a menu and we knew what that meant. It was time to see if we could make the oink meter go full tilt. The man has outstanding taste in food, so we let him have the floor. Remembering that when I ordered, I prefaced the order with “For our first course,” Randall made the following request for the second course. There was an order of gobhi, which were spiced cauliflower roundels, potatoes, and green peas, all seasoned and sautéed in traditional North Indian style. There was Goan lamb vindaloo. This West Coast favourite that was flavoured in the former Portuguese territory of Goa and in the great city of Bombay — How’s that for trivia? — consisted of tender morsels of lamb marinated with aged vinegar and a blend of spices, including a sprinkling of chillies. The big surprise is that the vindaloo was not spicy hot the way vindaloo is. Although it was a delicious dish, we have a feeling it was prepared for the American palate. Next time we will request to have it prepared the way the natives in India eat it — spicy enough to make it feel like heat is rising up from your scalp. But that was not all. We rounded it all out with a Lucknowi biryani. This dish was long grain basmati rice flavoured with saffron and cooked with chicken in a delectable blend of spices and herbs, served with raita, gobbled up by five individuals with tremendous appetites. The oink meter was dinging and there was even this one middle aged couple that kept staring at us. Perhaps they had not seen people eat so much food and be civilized while doing so, or they were just fascinated at some of our conversation that involved liquor licenses, mowing lawns, and trimming hedges. After all, we are all engineers. What do we know about tasting tests and landscaping? How much would you think we paid for all of the food we ordered? A few hundred dollars? An eye-popping amount for such good eats? The tab came out far less than we expected. Then again, this was a food bill only because we did not order any drinks. Wait. I take that back. We all had tea: four of us having chai and one having regular Indian tea. 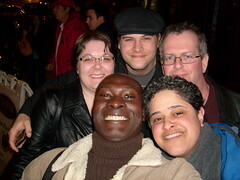 But the bill still came out and left us all with smiles on our faces, food in our bellies, and an assurance that we all had taken full advantage of life. Devon Avenue has its fair share of sit-down Indian restaurants and corner stores. Certainly on a frosty Chicago afternoon or evening when you are in the Devon Avenue area and your belly starts telling you to find a restaurant fast, try Tiffin. The service is great. The food is outstanding. And you can see how much you can tilt your oink meter. *grins* It was great joining you all. I’m definitely in for Jamaican! The colors and the textures…the curry and cardamon are wafting through my laptop!! Aha, then my write-up has served its purpose. The photos do indeed look appetizing, but the actual taste of the food was pure heaven.